Turns out these two people are one guy, who was at the St. Paul Grill a couple of weeks ago because he's interested in talking about his performance in "Hamlet,'' which opens Friday. He's not particularly interested in talking about the Internet. In fact, he doesn't have a computer. Shepard writes on a burgundy typewriter made in Germany, which he describes as looking like an old convertible. Much of the time, Shepard writes the same way the gentleman who wrote his current project wrote: in longhand. But Shakespeare wouldn't immediately recognize this new "Hamlet,'' which uses much of the original language but is set in the present. Hamlet (Ethan Hawke) is battling his stepfather, who he believes killed his father, for control of the Denmark Corp. (in the pre-mergers-and-acquisitions Elizabethan era, Shakespeare had them battling over the country of Denmark). Shepard plays the ghost of Hamlet's father. Shepard has seen enough off-kilter productions of his own work to be wary of that sort of thing (and he's not fond of the movie versions, which include "A Lie of the Mind'' and "Simpatico''), but he thinks this "Hamlet'' is a fine way of getting at Shakespeare's beautiful language. Even if the Bard didn't really intend for the "To be or not to be'' speech to be delivered, as Ethan Hawke does, in Blockbuster Video. Shepard found enacting Shakespeare's language intimidating. " For example, Shepard cites a scene in which the ghost talks about the poison that killed him, reciting the scene loudly enough that you can imagine surrounding St. Paul Grill diners looking suspiciously at their Caesars. For Shepard, it was also important that his character's appearance demonstrate how shocking it would be for Hamlet to suddenly see his dead father. In the new version, there's no dry ice or soft-focus to blunt the impact of the ghost, who looks as real as the pop machine he occasionally springs out of. This idea of the dead revisiting the living is not new to Shepard, whose plays are full of characters haunted by a past they cannot reckon with. Not surprisingly, death is at the center of Shepard's new play, "The Late Henry Moss,'' in which there's a corpse on stage. It will be produced this fall, so it's too early to say much about it. Shepard also doesn't seem especially interested in chatting about his personal life, although he chuckles when it's pointed out that, between Lange's recent "Titus'' and his "Hamlet,'' they were both doing Shakespeare. Shepard has been known to enjoy cross country drives but says he spends "quite a bit of time'' in Minnesota, although he's more likely to be spotted in a feed store than a theater lobby here. 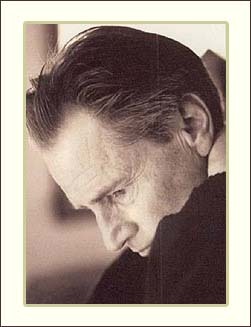 He reports that he is getting over his fear of flying, which should come in handy this fall if Sam Shepard, Celebrity, has to do any publicity for the Matt Damon movie, "All the Pretty Horses,'' in which he co-stars, or when Sam Shepard, Playwright, attends the opening of "The Late Henry Moss'' in San Francisco.